Sixteen-year-old pitcher Kaito Yuki poses for a picture in Osaka Prefecture on Sunday after signing a minor league deal with the Kansas City Royals. 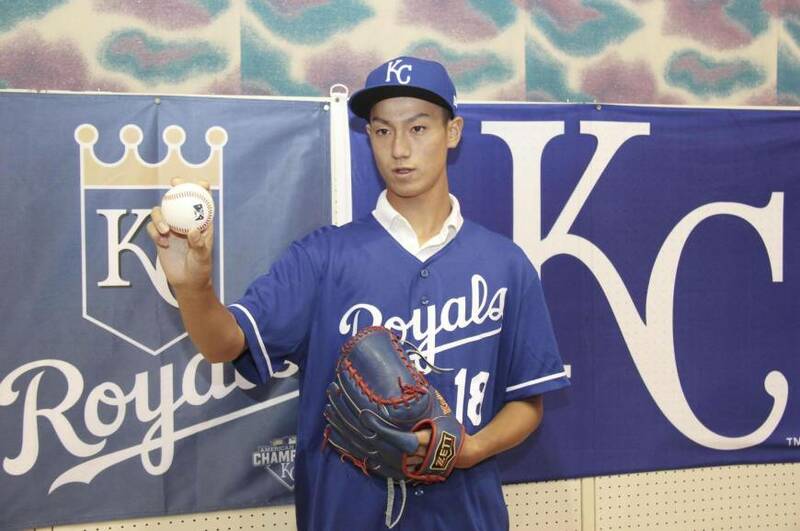 （July 8 The Japan Times )　OSAKA – Sixteen-year-old pitcher Kaito Yuki, who signed a minor league deal with the Kansas City Royals, said Sunday he chose turning pro over playing high school ball, believing it will be his shortcut to the major leagues. “My goal is to do well in the majors. Not everybody is given that chance, so I want to do my best,” he told a press conference in Osaka Prefecture. Yuki, who represented Japan in a youth tournament in the United States last year, said he was impressed by the size and ability of the players in the country. He then shifted his focus to the majors, and rejected offers from Japanese high schools in order to pursue a baseball career overseas. “I wanted to play in the United States as soon as possible, rather than playing high school ball at Koshien Stadium (in Japan’s iconic national championship),” said the Osaka native, whose fastball is typically around 140 km (87 miles) per hour. Yuki has agreed to a standard seven-year minor league deal with the Royals and will move to the United States as early as this August, after the paperwork is completed. He is scheduled to participate in a training program at the ballclub’s facility in Arizona. Since graduating from junior high school this spring, Yuki has been working out in a gym and training with his junior high school team. He also revealed he is studying English every day before his move to the United States. “I’m anxious, but I am more excited now,” he said.